Monogram Studios certainly got its money's worth out of contractee Wayne Morris, profitably plunking him into virtually every film genre known to man. 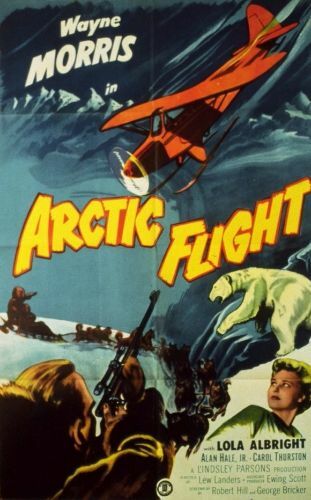 In Arctic Flight, Morris plays an Alaskan bush pilot named Mike, hired to take a tenderfoot named Wetherby (Alan Hale Jr.) on a hunting trip. It soon develops that Wetherby is actually--gasp--a communist spy, who intends to take photos of Alaskan military installations on behalf of the Kremlin. By the time Mike finds this out, Wetherby has ingratiated himself with everyone in the region, thus no one believes Our Hero's shouts of "Red! Red!" The tension mounts steadily to an edge-of-seat climax. Lola Albright delivers the film's best performance as a self-reliant schoolteacher assigned to the desolate Little Diomede region.